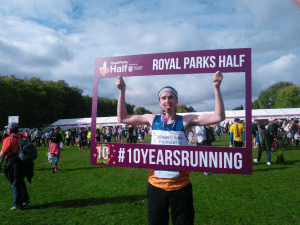 The Royal Parks Foundation Half Marathon takes place each October, starting and finishing in the stunning Hyde Park. The route takes in a number of iconic London landmarks as well as four beautiful Royal Parks - Hyde Park, Green Park, St James Park and Kensington Gardens. In its 11th year this is fast becoming the UK's most popular half marathon, with a flat picturesque course, fantastic green credentials and lots going on at the finish with fitness stalls and food fairs. Great organisation and facilities. Please fill out the form below and we'll be in touch within 48 hours. Do you have your own place in the Royal Parks 1/2? If you have been lucky enough to secure your own place in the Royal Parks 1/2, and would like to run in aid of the Brain & Spine Foundation please call 020 3096 7879 to connect with our team. You will still have access to all the benefits of being part of #teambrainandspine as listed above!